Dupont d’Isigny pays a special attention to its customers’ expectations to offer private label products answering their wishes and their market expectations : 90% of the total volume is sold to private label distributors. Dupont d’Isigny’s brand has a strong regional reputation in Normandy. 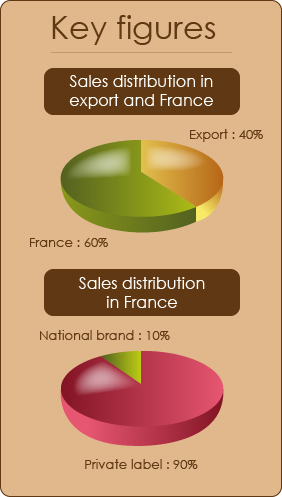 Its main products are all labelled “Gourmandie”, guaranteeing the use of high level quality products and traditional recipes from the region of Normandy. The company currently operates in more than 40 countries, of which : Europe, French overseas territories, Asia, the Middle East countries, the United States, Canada and Australia. Food Industrial Products (BtoB) are sold to professionals who use them in their own recipes. We can thus find Dupont d’Isigny’s ingredients, like chunks or cream caramel in cookies, pies, ice creams or whatever. With a modern industrial equipment and a knowledge of European markets, we can propose our industrial capacity to outsource some production of our competitors.